Additionally, the deck uses 2 "Morphs" that do not belong to any of the suits. There are 13 ranks in each suit: First (1), 2 - 10, Thief (11), Scholar (12), Lord/Lady (13). The First of Paws is also called "The Hunter". The face cards of each suit have alternating genders. Black suits start with male, red suits with female. 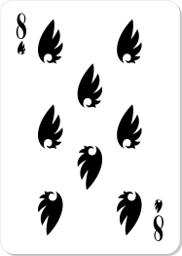 This means there are two black Lords and two red Ladies, and the rest of the face cards follow the alternating order. 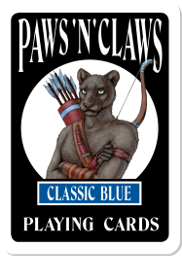 The Paws 'n' Claws deck includes a number of games tailored to the deck, but most classic card games can also be played using the Paws 'n' Claws deck, substituting suits as needed. Click on the names of the games below to expand the rules for that particular game. INTRODUCTION: The aim of this game is to form a marriage and start a family. The larger the family, the better. 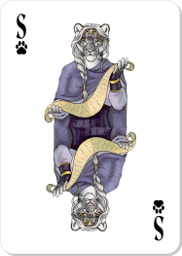 PLAYERS AND CARDS: Lords and Ladies is a game for 2 or 3 players using a single deck of Paws 'n' Claws cards with the values 2 to 6 removed, including 2 Morphs, leaving 34 cards in the game. GAMEPLAY: Each player gets 6 cards on their hand, 4 cards are dealt open on the table. The remaining cards are set face down as a drawing pile. The players try to from a marriage from a male face card and a female face card on their hand. Spot cards of the same suit are collected to form a family. The male face card determines the suit of the family. Each player now in turn can swap out one card from their hand for one card in the middle. If none of the players wants to swap a card, 4 new cards get drawn from the pile and replace the current open cards. This goes on as long as there are cards left to draw, or one of the players puts down their cards, believing their family is the strongest. Each remaining player in the round can swap one last card before tallying up the score. Morphs can be either one of the parents or a family member. Two Morphs can not form a marriage. If one of the Morphs is a parent, the suit of the other parent determines the family suit and its rank is the family rank. INTRODUCTION: The aim of this game is to get rid of all your stocked cards. The player who remains in the game the longest loses the game. PLAYERS AND CARDS: Meow-Meow is a game for 2 to 4 players using a single 54 cards Paws 'n' Claws deck including 2 Morphs. 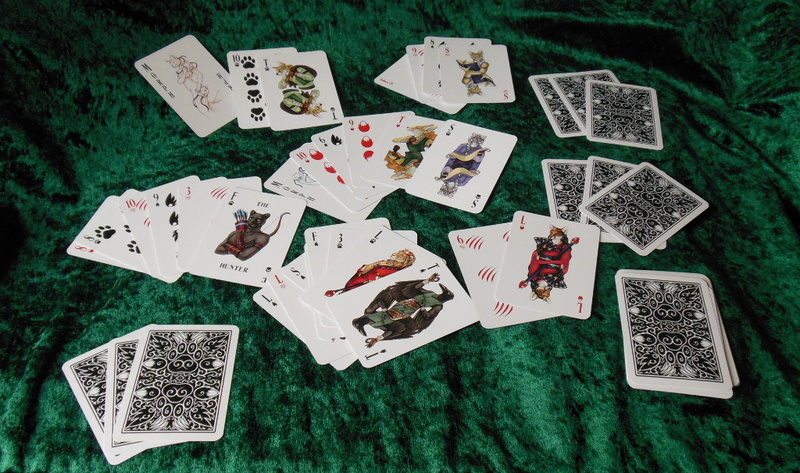 GAMEPLAY: The players get dealt 2 sets of 5 cards each, one set is placed face down on the table as their stock, the other set is for the player's hand. The remaining cards are placed face down in the middle of the table, the topmost card is placed face up next to the pile. After dealing, each player turns the topmost card of their stock pile face up, revealing the card to all other players. 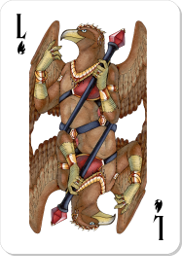 In case one or more players reveal a Morph at this point, they place them face up on the card in the middle in order of their turn before the regular game starts, the last one deciding which suit to play next. Revealing a second Morph causes the same thing to happen, just twice. 1. Put a card from their hand on top of the card in the middle of a matching suit or value. If they use a Morph to match, they decide what suit must be played next. 2. Use the topmost card on their stock to match the suit or value, turning the next one over. 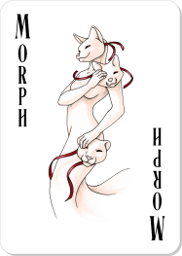 If the player reveals a Morph, they may immediately discard it, choose the next suit, and then turn over the next card while still keeping their turn. 3. Place one card from their hand face up on their stock pile. This card can not be a Morph, and it can not be a match to the card on the table. After this, the player draws a new card to fill up their hand back to 5 cards and the next player continues the game. In case the players run out of cards to draw from, keep the topmost card from the discard pile and mix up the remaining cards, placing them face down to continue the game. WINNING: A player who manages to put the last of their stock cards on the discard pile leaves the game. The last player with cards in stock loses the game. INTRODUCTION: The aim of the game is to take as many cards from the table as possible, with as few of your own cards as possible. 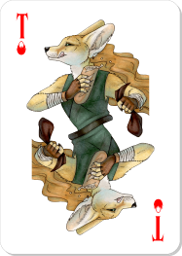 PLAYERS AND CARDS: Tail Sweep can be played by 2 to 6 players, using a 52 cards Paws 'n' Claws deck, with the Morphs removed. 1. A player tries to take cards from the table to their score pile by matching the card values. For example, they take a 7 from the table by using a 7 from their hand. Or take a 4 and a 2 from the table by using a 6 from their hand. If there are several possible combinations the player decides which one to choose. A player is not obligated to score cards. 2. Drop a card from their hand to the table that does not match any of the values. 3. Use a Thief to gather any number of cards from the table that add up to a maximum of 15 points. This is called a "Steal". A Thief can also be used to take another Thief. If a player manages to clear the table they performed a Tail Sweep and set aside one card as a reminder for extra points in the score count. The next player must set down a card on the empty table. Taking the Hunter also awards extra points in the score count. Once all players used all of their cards, the dealer gives everyone 4 new cards and the game resumes. If there are not enough cards left to give everyone a full hand, the remaining cards are added to the table. When there are no more cards to deal out and all players have emptied their hands, the remaining cards on the table go to the player who scored last. WINNING: Each player now counts their card values and adds them up. A Tail Sweep scores 30 points, the Hunter scores 20 points. The player with the highest value wins. INTRODUCTION: The aim of this game is to get rid of all your cards by putting them down in pairs of the same value. PLAYERS AND CARDS: Never Alone is a card game for 2 to 4 players using a single 54 cards Paws 'n' Claws deck including 2 Morphs. 1. Set down a pair of cards of matching value, e.g. two 10s, two Thieves, two Firsts. Morphs can be paired up with any other card, even another Morph. The pairs are discarded face up on a separate pile. A player can only discard one pair at a time. 2. 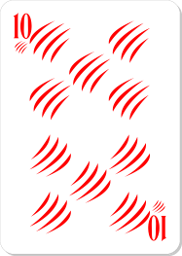 If the player has no pair they must draw a new card. If they have a match now they can get rid of that now, setting the pair onto the pairs discard pile. If they don't have a match, they must discard one of their cards face up to a second pile. 3. Ask the previous player for a trade. If the player accepts both of them select one card from their own hands and exchange them with each other, without showing the cards to the rest of the players. After that, the player in turn can now discard a pair if possible. Should the players run out of cards to pull from the stock, mix the single discard pile, turn it face down, and resume the game. WINNING: The player who manages to get rid of all their cards wins the game. The player with the highest score on their hand loses. Firsts count 1, Thieves, Scholars and Lords count 11, 12 and 13 respectively. Morphs count 20. All other cards count their face value. In the event of a tie, the players draw cards one by one, adding the values to their hands, until one of the players has a higher score and loses the game. INTRODUCTION: The aim of this game is to avoid collecting cards as much as possible by lying to the other players. 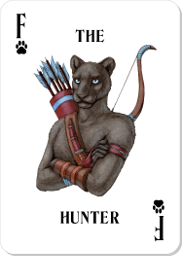 PLAYERS AND CARDS: Tail's on Fire is a card game for up to 10 players using a single 54 cards Paws 'n' Claws card deck, including 2 Morphs. GAMEPLAY: The cards are shuffled and placed face down on the table as a drawing pile. One card is turned over as a challenge and placed on the table next to the drawing pile. The player draws a card from the drawing pile, calls out a card value that claims to be better (equal is not enough) and places the card face down next to the challenge card. The next player will draw a card and claim to be even higher than the previous one. If another player doubts it, they call "Liar" and turn the card over. If it was a lie, the lying player gets all the face down cards. If the challenge card was a Morph the player must be lying, because Morphs can not be beaten. If it was legit, the accusing player gets all the face down cards. Morphs can claim any value, they are better by default. If the playier lied about claiming a Tails card, their tail is now on fire and they can't lie anymore. They must play openly and take the face down cards until they legitimately claim a challenge card. They can't accuse others of lying while their tail is on fire either. If a player can't draw anymore, or no new challenge card can be turned over, the face up pile is reshuffled, except for the topmost card, and repurposed as drawing pile. The game continues until there are no cards left. WINNING: The player(s) with the highest number of cards lose(s) the game. INTRODUCTION: This is a drinking game with simple rules, but it can also be played casually just for fun. PLAYERS AND CARDS: Sweet Like Honey is a game for an arbitrary number of players using a single 54 cards Paws 'n' Claws deck including 2 Morphs. GAMEPLAY: Everyone draws a card, and the player with the lowest value drinks a shot of a sweet liqueur or mead, or just counts one losing point. If there is a tie, the tying players draw more cards each until a lowest value is found. If a player draws The Hunter, everybody else must drink a shot (or count a losing point). If a player draws a Morph, they must drink a shot, regardless of the remaining overall outcome. WINNING: Due to the nature of this game, there is no real winner, only a bunch of happy, drunk players. If you play casually, you can set an arbitrary value of losing points to determine the loser of the game. 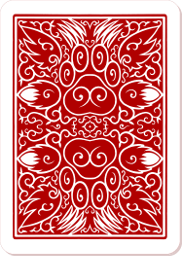 This card deck features the first released card illustrations with beautiful red back ornaments. This card deck features the first released card illustrations with beautiful blue back ornaments. Tabalon Blackpaws for valuable suggestions and ideas during the development of this card deck and the game rules.